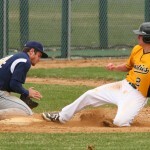 The Gustavus baseball team wrapped up Minnesota Intercollegiate Athletic Conference play with a satisfying doubleheader sweep over Concordia-Moorhead on Saturday afternoon in St. Peter. The Gusties won the first game 6-1 behind the strong pitching of Kellan Euerle and then claimed game two 4-3 thanks to a clutch one-out, bases loaded single by Timmy Miller that scored the winning run in the bottom of the sixth inning. The Gustavus baseball team split its MIAC doubleheader at Hamline on Wednesday winning game one 3-0 and losing game two 9-8 in 11 innings. Cody Sukalski led the Gusties in the first game as he pitched a five-hit complete game shutout, while also going 2-for-4 at the plate with a triple and one RBI. The Gustavus baseball doubleheader with Saint John's and the softball doubleheader with Saint Ben's both of which were scheduled to be played on Saturday afternoon have been postponed due to rain. Senior pitcher Cody Sukalski fired a complete game two-hit shutout to help the Gustavus baseball team defeat Carleton 1-0 in the first game of a MIAC doubleheader in Northfield on Friday afternoon. The Knights scored five runs in the first inning of the second game on their way to a 5-0 win and a split with the Gusties. 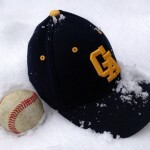 The Gustavus baseball doubleheader against Carleton originally scheduled for Tuesday in Northfield and moved to Wednesday and then Thursday has been postponed again due to cold and rain and re-scheduled for tomorrow (Friday) in Northfield at 2:30 pm. The Gustavus baseball team extended its win streak to four games by sweeping a non-conference doubleheader against Martin Luther by the scores of 10-1 and 7-0 in St. Peter on Monday afternoon. Cody Sukalski led the offensive onslaught with five hits in eight at-bats and four RBI in the two games. 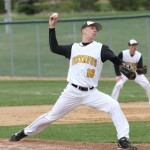 The winning pitchers were Tom Jaede in game one and Bryce Bintzler in game two. The Gustavus baseball team used solid pitching and clutch hitting to pick up an important doubleheader sweep of Bethel by the scores of 4-1 and 4-3 on Saturday afternoon. Kellan Euerle pitched a complete game, three-hitter for the Gusties in the first game, while Taylor Fish pitched four shutout innings in relief of Connor Norris to pick up the win in the second game. The Gustavus baseball team dropped two close one-run games to first place Macalester on Thursday afternoon in St. Paul by the scores of 4-3 and 3-2. 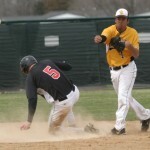 Mike Holbrook led the Gusties at the plate as he went 3-for-6 with a run scored and one RBI in the doubleheader.